Originating from the ABC Taxis business founded by Mr J Lambley in 1945 their first full sized PSV vehicle is believed to have been acquired in 1961. With Guildford lying on the boundary line between London Country Buses and Aldershot & District there was always scope for independent operators (over the years this had included Safeguard, Yellow Bus Service of Stoughton and Tillingbourne). Under the Blue Saloon name bus services were started on 1st March 1973. The first route commenced after a licensing dispute with both London Country and Tillingbourne as to who should run it. This was from Guildford to Boxgrove Park, later extended westwards to Woodbridge Meadows. By the time of the 1980 timetable shown below there two routes, with route 1 starting at Woodbridge Meadows industrial estate, then alongside the River Wey, passing through the town centre and on to London Road Station and St Lukes Hospital, then out along Warren Road before terminating at Collingwood Crescent on a loop through Boxgrove Park to the east of the town. Route 2 also started from Woodbridge Meadows, following route 1 into the town centre and London Road Station, then running in a south easterly direction to a terminal loop along Pewley Way and Addison Road in Charlotteville. Operations commenced using three RF buses with comprehensive destination displays, and Bristol LH were to become favourites for this operator too. In 1981 the fleet comprised fourteen PSV vehicles, of which five were buses and nine were coaches. Both the Blue Saloon routes were run hourly. In some ways the services along Warren Road (former 451) and Pewley Way (former 448A) were 'orphan routes' that had originally been short workings for London Country and then passed to Tillingbourne with little success and later Safeguard tried too. In 1980 Blue Saloon had ambitions to extend the operations of their blue and white buses further eastwards to Merrow Park although this seems not to have happened. The Blue Saloon name had previously been present in this area in pre-war years under the ownership of Mr Locke, with routes to Ripley, Send and Woking. Mr Locke, who started in 1924, sold out to Aldershot & District in January 1938 with his routes and vehicles shared between them and London Country Buses. Mr Lambley of ABC had driven for Mr Locke and acquired the right to use the name of the defunct operation. A major reorganisation of bus services in Guildford took place in 1979. Vehicles were operated under the Weyfarer brand name with an interavailable ticket. A proposal was put forward in 1983 jointly by Safeguard, Tillingbourne and Blue Saloon to take over all of the town services in Guildford themselves. After some initial favourable consideration by the local authority it was impractical to proceed, and doubtless the idea was not supported by London Country or Alder Valley. Blue Saloon adopted the 'Hoppa-Shoppa' name for their own local services. Change did come in April 1985 with further reorganisation of local services. 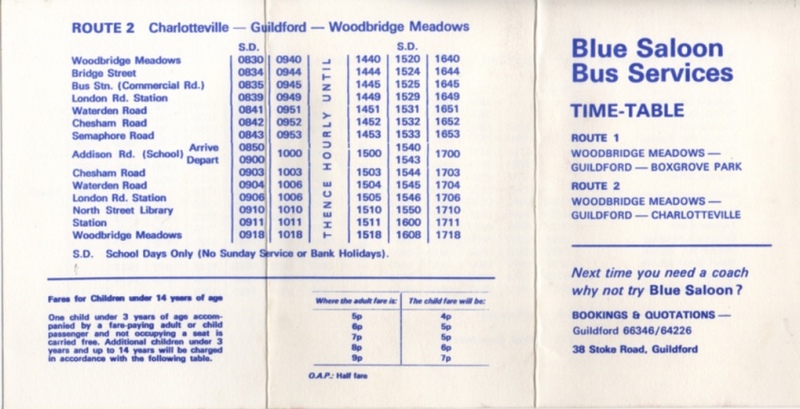 With both of their routes remaining hourly Blue Saloon route 1 became the G1 and operated from Boxgrove Park into Guildford then a new section west to OnslowVillage (replacing Alder Valley 229) and no longer serving Woodbridge Meadows. Route 2 became the G2 and ran from Charlotteville through Guildford to Woodbridge Meadows, then extended north to Grange Park. The section from Guildford to Grange Park was also worked hourly by Alder Valley. There was also a Friday only route 3 from Guildford to Ripley, Ockham and Woking. The 1985 fleet comprised 23 vehicles of which 7 were buses. Photographs online show Blue Saloon involved in other routes in the post-deregulation years including route 6 to Elstead (1987) and route 532 to Merrow, Burpham, Chandon, Horsley and Bookham (1988). The Blue Saloon depot was on the Slyfield Industrial Estate and besides the bus services there was an extensive coaching operation. In 1983 they acquired Warner's of Milford, a coach firm based near Godalming, with four coaches retained and running in Warner's livery for some years afterwards. Some of their coaches also ran with 'GB Tours' names, a joint venture with Gastonia of Cranleigh. The Blue Saloon business was sold to London & Country in 1996 who continued to use the depot. Loondon & Country evolved into Countryliner who served the Guildford area until they were placed in administration in 2013. 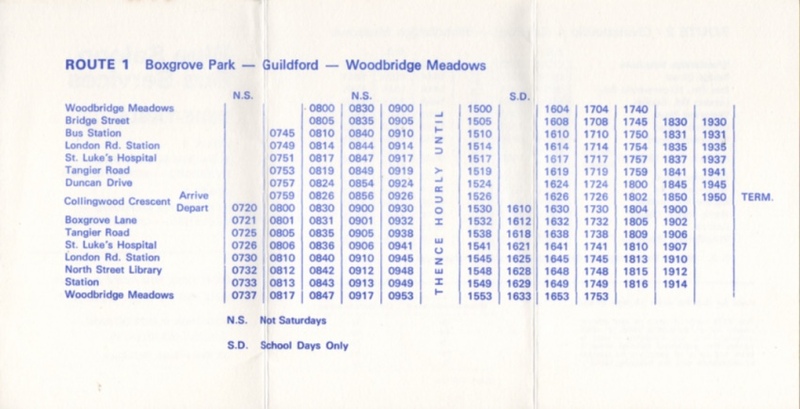 Timetable believed to date from circa 1980 - note the generous layover time allowed for route 2 at Woodbridge Meadows terminus.